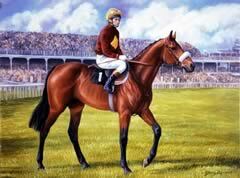 The late great Red Rum is undoubtedly the most well-known and successful Grand National horse of all time. In fact, as testament to "Rummy's" greatness, he is buried adjacent to the winning post at Aintree. His epitaph reads: "Respect this place, this hallowed ground, a legend here his rest has found, his feet would fly, our spirits soar, he earned our love for evermore". He certainly did. Red Rum's first National attempt came in 1973. Ridden by Brian Fletcher, the then 8-year old trailed Crisp for much of the second circuit, eventually catching him almost on the line to win by just three quarters of a length. It was before the days you could bet in play, and it's probably just as well as many punters would have lost their shirts. Crisp's own performance was remarkable in light of Red Rum's subsequent achievements in the great race. He was giving Red Rum an amazing one and a half stones; Rummy had to beat the course record to catch him and jockey Richard Pitman who went on to become a racing pundit for the BBC. The race was one of the most memorable Grand Nationals of all time. Richard's ex-wife, Jenny, became the first ever woman to train a National winner in the shape of Corbiere – a 13-1 shot in 1983. Of course, as most people now know, Red Rum's incredible story had only just begun. The following year he returned to the course, retaining the National despite carrying the top weight of 12 stones. The following two years, Red Rum finished runner-up behind L'Escargot and Rag Trade respectively – giving weight to both horses, then came back for what was, arguably, his greatest triumph in 1977 winning the National aged 12 at 9-1 and causing national celebrations. Those looking at the Paul Nicholls Grand National betting this year will hope the great trainer has unearthed a horse of a similar calibre. The following year as the nation waited for Rummy's sixth tilt at the title, the great horse suffered a hairline fracture the day before the race and was retired by trainer Ginger McCain. When Red Rum died in October 1995, aged 30, his passing made the front pages of the country's national newspapers as befits the greatest National legend of all; the beloved "Rummy".